Ravalement | One quality, the finest. 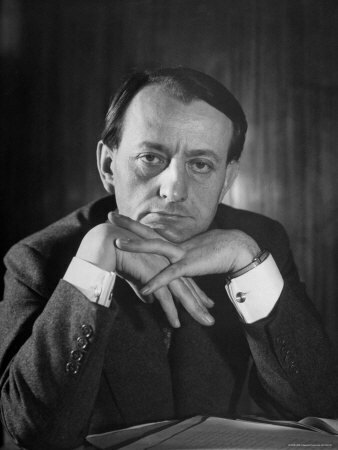 French writer and politician André Malraux was born in Paris on November 3, 1901. He lived in a world of women – his mother, aunt, and grandmother – after the divorce of his parents. Malraux was largely self-educated. He began writing for a magazine and became an editor for a specialty publishing house. After a journey through Indochine, today’s Cambodia, Malraux became critical of the role of the French in the colony. This experience gave rise to his most famous work, known in English as Man’s Fate, and in French as La Condition Humaine for which he won the Prix Goncourt. Malraux joined the Republican forces in Spain during the Civil War. His experiences there led to another book, Man’s Hope or L’Espoir. When World War II came, he joined the French Army. He was captured in 1940 but escaped and joined the Resistance only to be captured by the Gestapo in 1944. Malraux commanded a tank unit in the defense of Strasbourg. He received a number of decorations after the war including the Médaille de la Résistance and the Croix de Guerre. Once again, his war experiences led to a book, The Struggle with the Angel which was destroyed by the Gestapo. The first section somehow survived and was published as The Walnut Trees of Altenburg. After the war, General de Gaulle appointed Malraux to various ministries, including Cultural Affairs. The writer turned to the subject of art. 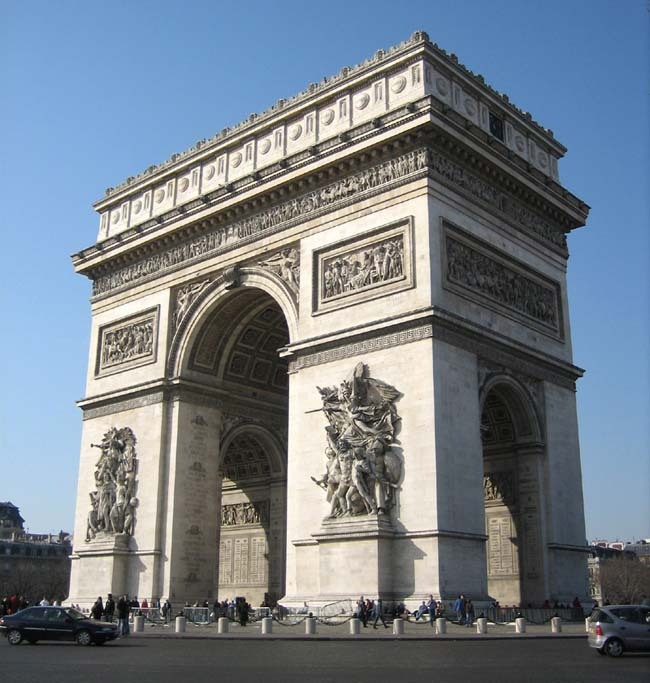 He launched one of the most practical and effective beautification programs in France in the 1960s – cleaning the major monuments and thus transforming them from black to gleaming white. One of my French teachers, who was a girl at the time of the program, told us how disconcerting it was to discover that buildings she thought were black were actually white. 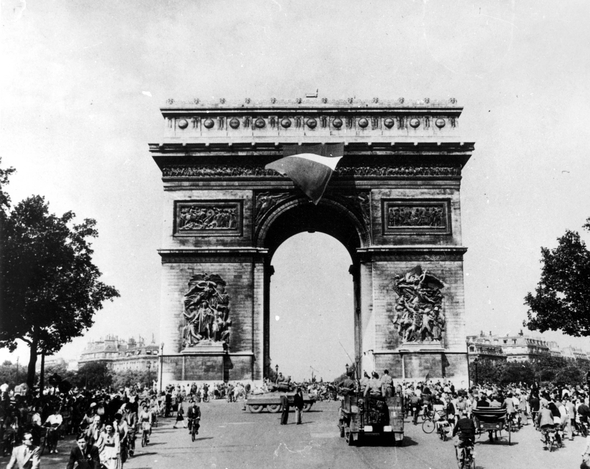 Check out the Arc de Triomphe before and after Malraux’s initiatives. Malraux died on November 23, 1976. Twenty years later, his ashes were transferred to the Panthéon in recognition of his contributions to French culture. Today’s word, ravalement (rah-val-mehn), refers to cleaning the exterior of a building. By law, this must be done every ten years in order to keep Paris beautiful. Haussman, the man responsible for modernizing Paris under Napoléon III, made this a law for privately owned buildings in 1852, but it took another 110 or so years and André Malraux to bring the same attention to the city’s great monuments. Merci, Monsieur Malraux. This entry was posted in Architecture, Literature, People and tagged André Malraux, La Condition Humaine, Man's Fate, Médaille de la Résistance, Prix Goncourt, ravalement. Bookmark the permalink.